Jumping cactus, rattle snakes, shotguns, a haunted house, camp fires, frozen clothes and all day on the trails. This is one hell of a recipe for a motorcycle launch. Riding through the San Jacinto wilderness it is, as the name suggests, not a busy place. We’re more rock hopping than rock climbing as we thread our way through the sweet-smelling pines of Thomas Mountain, in sight of Tahquitz Peak and Suicide Rock, both well-known with rock climbers. It takes some getting used to as a European to find endless trails so good, so easily suited to adventure bikes and with dirt so perfect after overnight low cloud dampened it down I had to get off my bike, take a glove off and feel the dirt between my fingers (true story). These are trails so sweet I keep expecting them to end, have to turn back or find a park ranger telling us off. 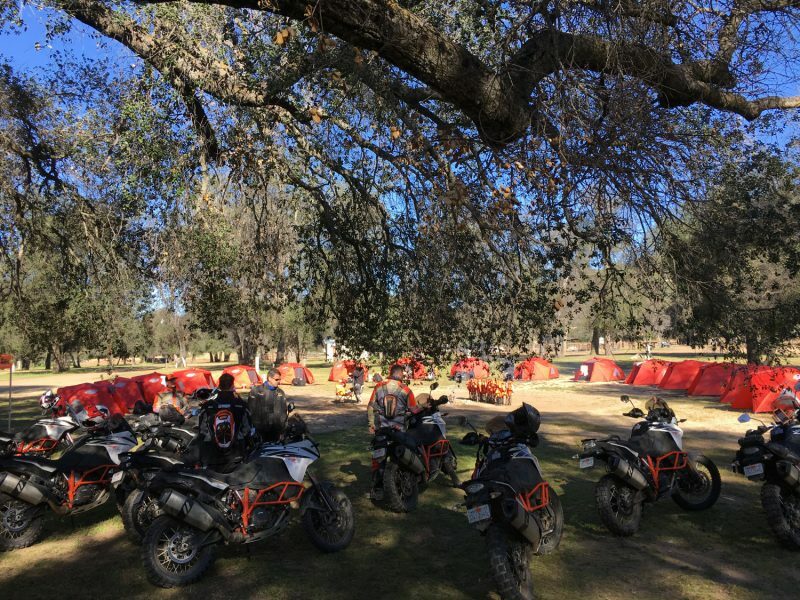 California’s network of trails we’re on are all perfectly legal and the KTM 1090 ADVENTURE R is brightly stretching its legs along every type of trail Quinn and his team have laid on for us. 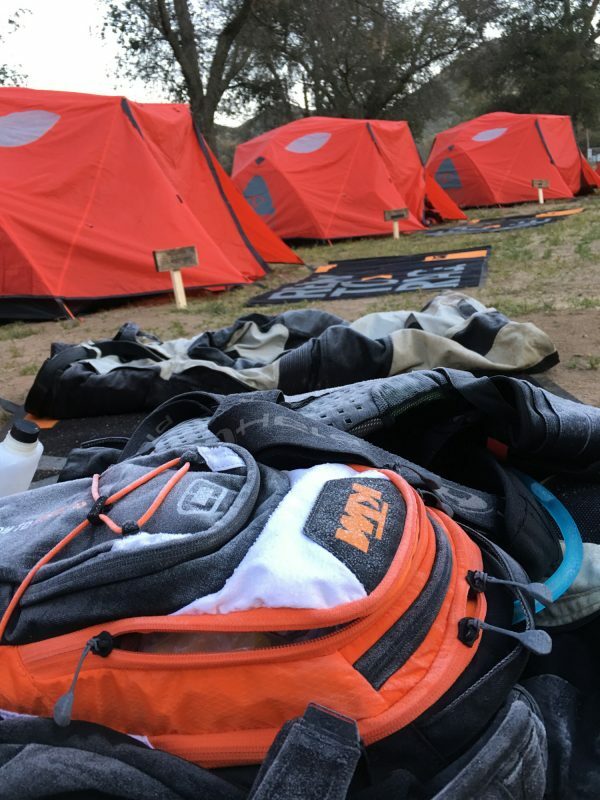 From rocky mountain track, loamy forest floor and dusty farm tracks we’re getting an adrenalin shot of exactly why KTM’s R model ADVENTURE bikes are just so popular in this part of America. 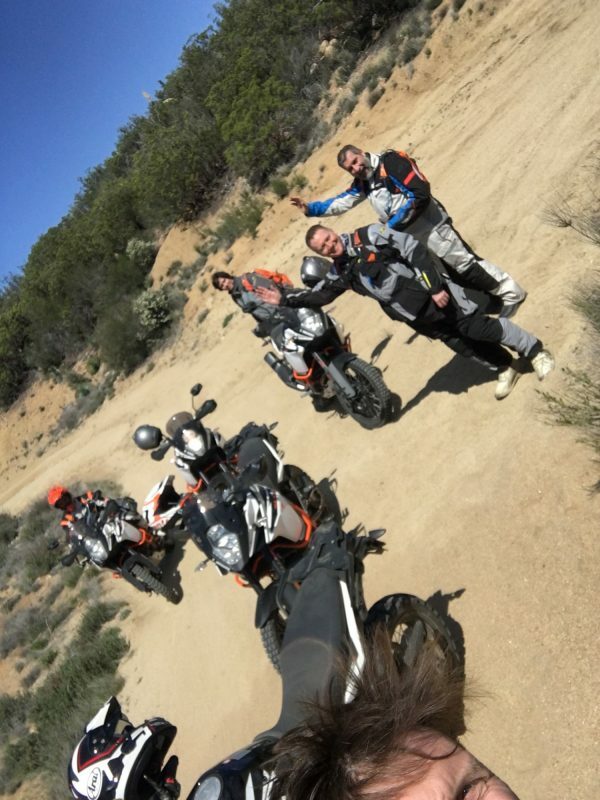 Eventually we find the Lost Valley road and drop in on Warner Springs to our overnight camp which hides down a soft, sandy fourth gear blast you could only have the bravery for after getting to know the KTM 1090 ADVENTURE R so intimately. It’s a true blast and a perfect way to end a day’s riding. Ed, the man behind our camp site at Chaney Ranch, is super-helpful and as ready with his trays of food, coolers of beer as he is with shotguns, clay pigeons and his stories about the ghost and former Hollywood actors who lived there. It really is a perfectly quiet place and but for the beers those ghost stories could’ve got to me. Next morning dawns fresh, icy fresh in fact as some of the guys who’d left their riding gear outside their tents found out all too quickly. The line-up of KTM 1090 ADVENTURE Rs look every inch like they’re on an adventure. Bleary-eyed riders slowly unfolding themselves from the tents for welcome hot coffee seem like cowboys rolling out a saloon back door looking for their horses. There’s a hot shower but Usain Bolt would’ve been happy with the times clocked-up getting into the clothes afterwards. Heading south, downwards in altitude and upwards in temperature as we head deep into the Anza-Borrego Desert and cactus country. To a northern European like me riding through a real desert brings an added element of danger you don’t get too often. The riding is still awesome but every once in a while I have to check myself mid-slide and shrink away to a calmer place. When the outside of the trail is a wall of textile piercing cactus spines you don’t want to run wide or drop off the track edge. It’s an offroad version of the stone walls at the Isle Of Man TT course where you know the consequences could spell disaster. Sure, stone walls are harder but the idea of crashing through needles fit for acupuncture onto rocks and landing next to a rattlesnake needs blocking out the mind. 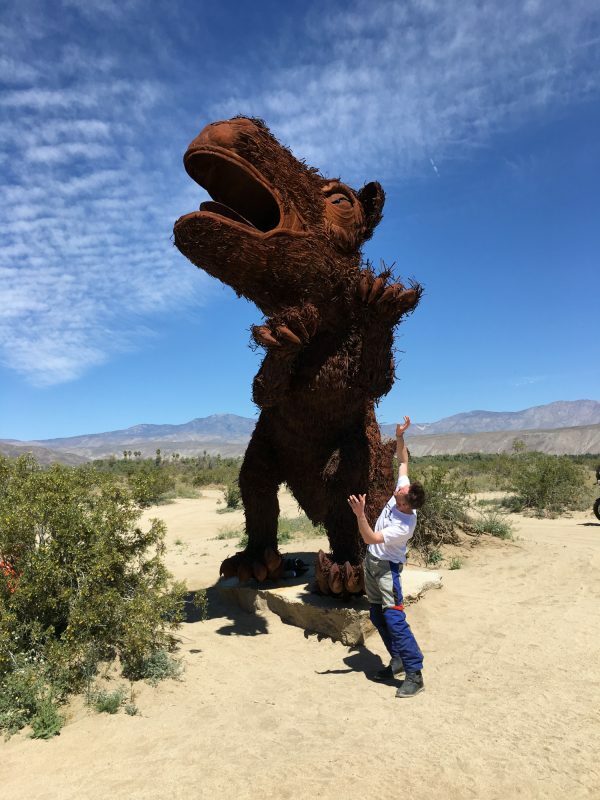 Our day two destination is a lunch stop among one of Ricardo Breceda’s giant sculptures in the Anza-Borrego desert. This place is hot, hot like you expect a desert to be and million miles from the frost covered Chaney ranch camp just a few hours ride behind us. The ride to get there is the one which has all riders smiling. It’s a snaking valley floor which at times is sandy, at times gently rolling hard-pack trail. This is the one Cody nailed as “probably his favorite in the world” and for the best part of an hour the KTM 1090 ADVENTURE R’s third and fourth gears see all the action while the brakes see none as the bike throws itself into a glorious spell of rear wheel steering. It’s the kind of riding where you appreciate why a motorcycle needs a narrower front tire and why the KTM PowerParts catalog wider footpegs make sense. The KTM 1090 ADVENTURE R’s 90/90-21 front Continental TKC 80 is guiding across the surface as you switch around on the footpegs to steer with your feet, leaning further back in the soft sand to get the rear Continental digging and driving. It’s the kind of trail you never want to end. 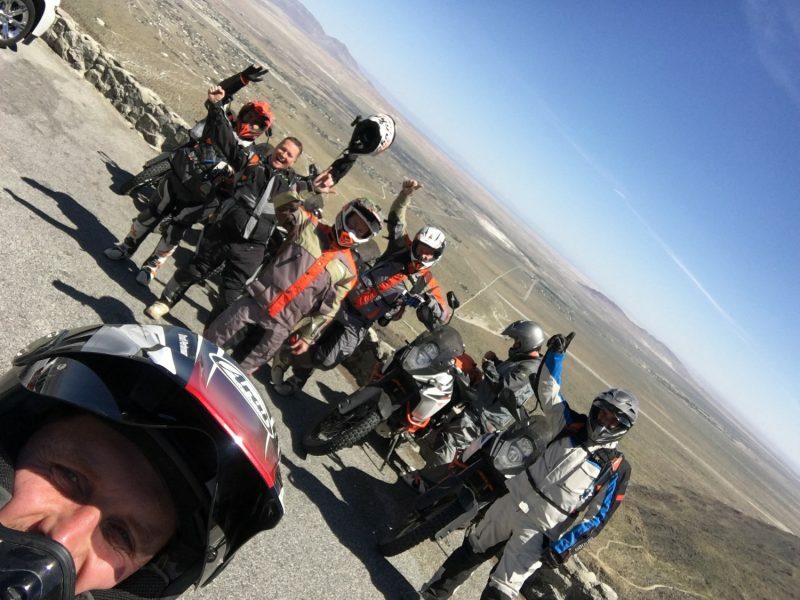 The road ride back towards Murrieta and KTM USA HQ should be a disappointment after a day and a half of California trails but as it rises up from the Borrego Valley floor a sweeping switchback road any mountainous country would be proud of keeps throwing entertainment our way. Dodging the tourists more intent on taking pictures than worrying about road safety adds to the fun. It’s a chance to take in the landscape and sample the road skills of the KTM 1090 ADVENTURE R too. Lazily strolling along in sixth gear the landscape changes quickly from desert, to rocky mountain pass to vineyards and miles of stud farms and horse paddocks. After two days riding trails and hills it is impossible not to think you’ve seen a pocket of the real America, a million miles it seems from the more usual tourist attractions like a Hollywood sign, Vegas casinos or the Statue of Liberty. The ride has taken in about every type of terrain you could think of and easily covers the spectrum of terrain any adventure bike longs for. You haven’t truly stretched a bike´s legs until you’ve scaled sweet mountain forests floor, wafted through sun-drenched vineyards, smoked past sleepy Indian reservations, rattled along rocky jumping cactus infested, rattlesnake deserts and skimmed along powder-soft canyon floors so perfect you’d swear they were made just for you. A KTM 1090 ADVENTURE R is the true way to see America and no mistake.